Have you gotten your free Airtel 5GB on Airtel Smart Sim Offer yet? Probably you have tried it and you keep getting “you can only receive this offer once” but there are simply ways to get your free Airtel 4GB with IMEI tweaking on Android. Whether your device has root access or not, MediaTek or Snapdragon, this article will give you the best method to use. Before we begin, the source of the IMEI that gives free Airtel 5GB is from a HUAWEI phone, probably a modem with model E3531I-2 which is tied to Airtel Smart Sim Offer. This offer is to woo customers to join her network since others are already enjoying 4G network. Airtel SmartSim offer has really been dashing out huge data to all Samsung users and those that are not using Samsung has to change their phone IMEI to the smartphone even the Samsung users have to change their IMEI too in order to get this offer. Normally, When major telcos are promoting a brand/product like phones and modems, they give free Megabytes to woo customers. Once you are able to get this tweak your android phone with the device IMEI, you also will get the free 5GB. DISCLAIMER: Use with caution; Changing of IMEI is illegal in some countries, and I will not be held responsible for any consequences that befall the changer. Although if all steps are followed correctly, then it should work. 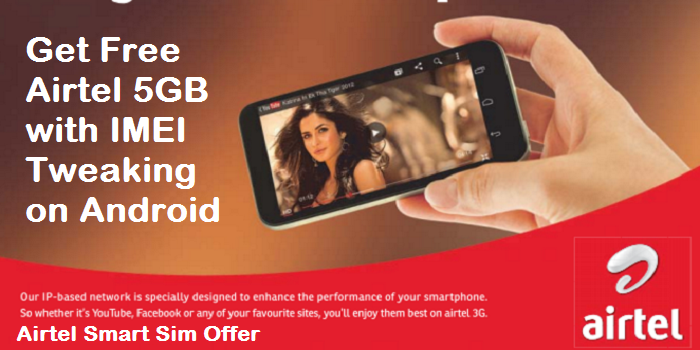 There are two methods to use in getting your free Airtel 5GB on Airtel Smart Sim Offer. You either use Apps like Chamelophon, MTK engineering mode, MTK droid Tools, etc or use SMS IMEI tweaking method which is best for all chipset especially for non-MTKs. We have compiled 8 splended ways to tweak Android IMEI as well as how to analyze IMEI for you here. All you have to do is choose the best method that works for you. But if after using any of the listed Apps IMEI tweaking methods and your Android IMEI reverts to original after rebooting your device, you can use the SMS method. Text S123456789012345 to 232 (NOTE THAT 123456789012345 is your valid IMEI number that you have successfully tweaked). If the imei is correct and valid then you will receive an sms but if you didn’t receive an sms then try and tweak another IMEI. Then, text JOIN to 141 and you should receive your own free 5GB, valid for a month. Still not getting your Airtel Smart Sim Offer? After tweaking your IMEI and sending JOIN to 141 but still not receiving your Airtel free 5GB, then you will need to use SMS Bomber App to blast the SMS. We realize you may need to send up to 10 SMS to easily get through. Download SMS Bomber for Android on BlackMart. Launch your sms bomber app. Then type TO: 141 in the first space. Then in the second box MESSAGE: JOIN. Then put the amount of numbers it will blast the Message kindly insert 10 . Then click on NO DELAY and tap on SEND. Immediately it will automatically blast your message 10times as ordered. And YES! it can be accummulated so keep blazing! Many are already enjoyinh theirs and I am sure you will get yours if you follow the guide above. If you have any question about this article, kindly use the comment box to share with us.